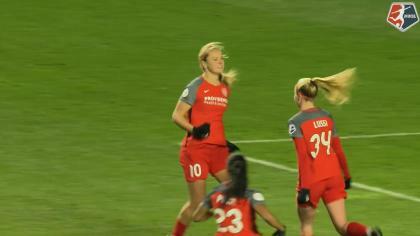 Portland Thorns FC put together back-to-back wins at Providence Park after defeating the Washington Spirit 2-1 on Saturday night. The Thorns now move to 6-1-1 at home so far in 2017 and 7-4-4 overall, good enough for third place on the NWSL table. They’re only three points off of the Chicago Red Stars’ first-place pace, despite missing multiple key players for international duty at the Euros. Midfielder Allie Long and forward Mallory Weber sent the crowd of 18,478 home happy after two second half goals to bag all three points. Forward Mallory Pugh nearly kicked things off early in Portland, with this chance in the 5th minute after some good build-up from the Spirit. Pugh found some space outside the box, and ripped a shot off before the Portland backline closed in on her, but Thorns goalkeeper Adrianna Franch was equal to the task and made the diving catch. The Thorns were unable to get a shot on target in the first half, but they left the locker room ready to get back into the match. Forward Christine Sinclair cleaned up a poor clearance from the Spirit back line and took her own shot from distance in the 51st minute that struck the crossbar. The rebound eventually fell back to the Thorns, but Lindsey Horan‘s second attempt was blocked wide. The Washington Spirit struck first, with midfielder Havana Solaun beating Franch in the 58th minute. Pugh sent in the initial cross from the right wing, and Solaun’s first touch hit the post before she herself cleaned up the rebound and walked it into the net past Thorns defender Katharine Reynolds. It would only take four minutes, however, for Allie Long to find the equalizer for Portland. 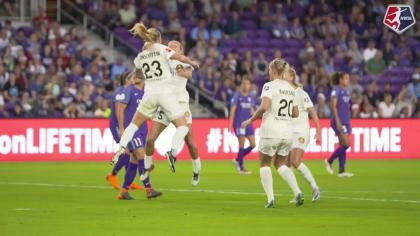 Defender Emily Sonnett provided the service off a free kick, and forward Tyler Lussi got a head on it and sent it back across the face of goal. Long was there to clean it up at point blank range past Spirit goalkeeper Stephanie Labbé. Finally, Weber found the winner in the 80th minute, only three minutes after entering the match for Lussi. Forward Ashleigh Sykes crossed the ball in from the end line after drawing Spirit defender Caprice Dydasco, and Weber slipped in behind her own defender for the close-range finish. And of course, as with any postgame interview these days in Portland, the requisite hijinks occurred. Portland keeps the home advantage after the international break, hosting the Houston Dash on August 5. The Dash are unbeaten in their last six matches, and have also won their last two games. The Washington Spirit will head to New Jersey on August 4 to take on Sky Blue FC, who have now slipped to fifth place in the standings. Match ends, Portland Thorns 2, Washington Spirit 1. Second Half ends, Portland Thorns 2, Washington Spirit 1. Attempt missed. Cheyna Williams (Washington Spirit) header from the centre of the box is just a bit too high. Assisted by Cali Farquharson following a set piece situation. Corner, Washington Spirit. Conceded by Adrianna Franch. Attempt saved. Mallory Pugh (Washington Spirit) right footed shot from the right side of the box is saved in the top left corner. Substitution, Washington Spirit. Cali Farquharson replaces Kristie Mewis. Offside, Portland Thorns. Christine Sinclair tries a through ball, but Allie Long is caught offside. Substitution, Portland Thorns. Kelli Hubly replaces Ashleigh Sykes because of an injury. Attempt missed. Tori Huster (Washington Spirit) left footed shot from outside the box is too high. Assisted by Meggie Dougherty Howard. Delay in match Ashleigh Sykes (Portland Thorns) because of an injury. Goal! Portland Thorns 2, Washington Spirit 1. Mallory Weber (Portland Thorns) right footed shot from very close range to the bottom left corner. Assisted by Ashleigh Sykes. Attempt missed. Lindsey Horan (Portland Thorns) right footed shot from outside the box is too high. Substitution, Portland Thorns. Mallory Weber replaces Tyler Lussi. Attempt missed. Kristie Mewis (Washington Spirit) with an attempt from very close range is close, but misses to the left. Assisted by Mallory Pugh. Attempt missed. Mallory Pugh (Washington Spirit) left footed shot from the centre of the box misses to the left. Assisted by Havana Solaun. Attempt missed. Allie Long (Portland Thorns) right footed shot from outside the box is just a bit too high. Assisted by Lindsey Horan. Substitution, Portland Thorns. Celeste Boureille replaces Katherine Reynolds. Offside, Portland Thorns. Emily Menges tries a through ball, but Lindsey Horan is caught offside. Attempt blocked. Caprice Dydasco (Washington Spirit) right footed shot from outside the box is blocked. Assisted by Kristie Mewis. Attempt missed. Hayley Raso (Portland Thorns) right footed shot from outside the box misses to the left. Assisted by Adrianna Franch. Attempt saved. Tori Huster (Washington Spirit) header from the centre of the box is saved in the centre of the goal. Assisted by Kristie Mewis with a cross. Attempt missed. Kristie Mewis (Washington Spirit) left footed shot from outside the box is close, but misses to the right. Assisted by Estelle Johnson. Goal! 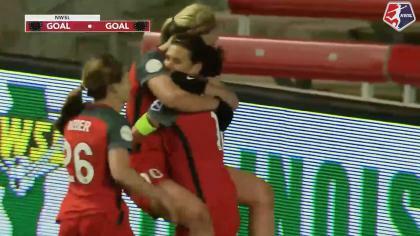 Portland Thorns 1, Washington Spirit 1. Allie Long (Portland Thorns) right footed shot from very close range to the bottom right corner. Assisted by Tyler Lussi with a headed pass following a set piece situation. Attempt missed. Allie Long (Portland Thorns) header from the centre of the box is too high. Assisted by Meghan Klingenberg with a cross following a corner. Goal! Portland Thorns 0, Washington Spirit 1. Havana Solaun (Washington Spirit) left footed shot from very close range to the centre of the goal. Havana Solaun (Washington Spirit) hits the right post with a left footed shot from very close range. Assisted by Mallory Pugh with a cross. Offside, Portland Thorns. Lindsey Horan tries a through ball, but Tyler Lussi is caught offside. Christine Sinclair (Portland Thorns) hits the bar with a right footed shot from outside the box. Attempt saved. Tyler Lussi (Portland Thorns) header from the centre of the box is saved in the centre of the goal. Assisted by Lindsey Horan with a cross. Attempt missed. Tyler Lussi (Portland Thorns) header from the centre of the box misses to the left. Assisted by Ashleigh Sykes with a cross. Attempt blocked. Kristie Mewis (Washington Spirit) left footed shot from the right side of the box is blocked. Assisted by Meggie Dougherty Howard. Second Half begins Portland Thorns 0, Washington Spirit 0. First Half ends, Portland Thorns 0, Washington Spirit 0. Attempt blocked. Tori Huster (Washington Spirit) right footed shot from outside the box is blocked. Assisted by Meggie Dougherty Howard with a headed pass. Offside, Washington Spirit. Stephanie Labbé tries a through ball, but Kristie Mewis is caught offside. Offside, Portland Thorns. Meghan Klingenberg tries a through ball, but Allie Long is caught offside. Corner, Portland Thorns. Conceded by Kristie Mewis. Ashleigh Sykes (Portland Thorns) is shown the yellow card for a bad foul. Attempt missed. Lindsey Horan (Portland Thorns) left footed shot from the centre of the box is too high. Offside, Portland Thorns. Emily Sonnett tries a through ball, but Hayley Raso is caught offside. Arielle Ship (Washington Spirit) is shown the yellow card for a bad foul. Attempt saved. Kristie Mewis (Washington Spirit) left footed shot from the left side of the box is saved in the bottom right corner. Assisted by Caprice Dydasco. Attempt missed. Tyler Lussi (Portland Thorns) left footed shot from outside the box misses to the left. Attempt saved. Arielle Ship (Washington Spirit) right footed shot from the centre of the box is saved in the bottom right corner. Assisted by Havana Solaun. Attempt saved. Mallory Pugh (Washington Spirit) right footed shot from outside the box is saved in the top right corner. Assisted by Kristie Mewis.